The Post November NaNoWriMo Post of Depression…in April. New year, old neurosis. You want to know how pathetic I am? I started this post Jan 15th, as a NaNoWriMo wrap-up and today is April 1st. How fitting since I’m feeling pretty foolish. Outside of my writing group exercises, the most writing I’ve done is a few sprints on our FB page. I could, in desperation, count the few sentences I’ve jotted here and there in the comment sections of friend’s blogs. But really, even those have been less than substantial. Thankfully, as spring begins to assert itself, my main story is finally finding it’s way back into my head. This is the first time I’ve faced a completed first draft and I’m feeling like a deer caught in headlights. Revising is not for wimps. I’ve quaked in the face of goals, rereading and reediting the same few chapters over and over. Must move forward. I even spent an entire day trying to talk myself into quitting writing altogether, though that may have been the flu talking. How to go about proceeding with the revision process has been weighing heavily on my mind. I’ve been searching for a method or plan of attack that makes sense to me. Shawn Coyne’s article What It Takes: The Math published on Steven Pressfield Online appeared in my inbox a few months ago helping to allay some of my editing fears and gave me a bit of structure to hang my work on. Though this is more an article about plotting from the beginning of the process (something I don’t do…maybe next time) it is helping me visualize where my story needs work and whether or not the ground work I’d already laid is on solid enough ground to continue. I feel confident that I’ve kept the word count garbage to a minimum (a typical NaNoWriMo bi-product) but there are holes that need plugging and connections that need rewiring. Characters that need fleshing out and a few that shall be meeting the axe. On March 6th I posted a link on our WriNoShore website about structuring your scenes. It’s an interesting method to keep in mind while revising. At this point I’ll try anything to get my mind back in the game. I mainly need to have a plan, a method to my madness so that I can consistently meet my work goals each day. Knowing what I need to accomplish help me focus and pushes me forward. Some links to the revising process. To those of you embarking on the April NaNoWriMo Camp, watch out for poison ivy, and have fun. It’s official, I’m a NaNoWriMo: Winner 2013. I finished on the 20th with a word count of 50,424. Since then I’ve pushed the count up to 53,433, which combined with 2011’s total brings this novel’s first draft to 116,725. There’s a lot of extraneous conversations and side story that needs to be cut; I’m guessing I can edit it down to 75-80K. While I’m relieved to finally have the first draft done, I didn’t really enjoy utilizing the same story for NaNoWriMo. I often had to look-up names, and try to recall details that weren’t fresh in my mind and it slowed my writing down considerably. Yes, I know I still finished a week before the deadline and I can shut-up now. We have an outstanding regional group, The WriNoShores, and they made a huge difference to many of our writer’s endeavors. We had a variety of well-attended write-ins from semi-serious all-day Saturday library affairs to small mid-morning cafe groups. We’ve become quite a spirited, and supportive group. The convivial nature of which was uplifting and inspiring. Happily, plans are afoot to continue meeting up after November. We still have one big Saturday write-in left. A potluck lunch is planned at which those who’ve finished will play cheerleader to those still trying to reach their goal. It should be a blast (it was except for those of us finished distracting those still workign out the last few thousand words-sorry Sarah!). We’ll wrap up the month Dec 8th with a TGIO Party and Reading, and present out own WriNoShore:Winner 2013 and participant certificates. Overall, another fantastic month of writing, whining and chocolate eating (it was genius having this start the day after Halloween). I love this song and this version especially. It’s one of the few I can recall the words to well enough to sing, though it’s best experienced if you or I–and preferably both–have had a few cocktails. But now summertime is over and I can no longer pretend I’m on vacation. There’s a chill in the air and I’ve just returned from Vermont where the trees have begun putting on the blaze of glory show. I haven’t been slacking off completely since my last blog post. I’ve been working steadily on The Illusion of Marriage but recently hit a bit of hiccup. I realized I’d been rewriting and reading the same chapters over and over and not making much progress. The diagnosis–lack of an outline. There comes a time when you have take a serious look at your process if you aren’t completing projects. While I’ve always been keen on the idea of outlining, the practice of it has eluded me. Presently, I’ve come round to believing that outlining is crucial to finishing. That’s where I am creatively. Steven Pressfield has a new book coming out Authentic Swing which is about the writing of his first novel, The Legend of Bagger Vance. He utilizes a way of outlining called Foolscap which he talks about in a new video series. It’s helping me conceptualize my own work, and frankly I just like listening to Steven talk. Yes! It is nearing that time of year again and the WriNoShores, our local group of NaNoWriMo participants, are gearing up for another epic month of write-ins, cookies and creative expletives. Sara, our intrepid ML, and I have a shiny new design featuring our mascot George, which I will reveal in a later post. George had an interesting summer observing teenagers in their natural habitat (sprawled on my couch in front of the television) and traveled to Smuggler’s Notch in VT on a writer’s retreat where he watched Sara and I sprawl on the couch in front of the television. Apparently, George needs a higher quality of experience than he currently being exposed to. I must apologize to Sara though, I’ve thrown a bit of a monkey wrench into the plans and taken on a new position, which unfortunately begins November 4th. Not that it’s unfortunate for me-I’m thrilled-but it does mean I won’t be available to attend the daytime write-ins during the workweek. I’ll really miss Mondays at Plum Island Coffee Roasters in Newburyport, and the Thursday crew at the Haverhill Public Library. No worries, I will still be my usual competitive self, aiming to be the first to fill out our super useful word counters with sparkly new stars (I have a reputation to uphold). As for my new job–I never expected to be a nanny again, but in an opportune moment of serendipity, a close family friend’s shiny new boy came early necessitating personal care. I offered my services and they accepted. I love that I can be there for them and I’m honored by their trust in me. I’m sure you’ll be hearing more about him in the future. YIKES! Also on our end-of-summer agenda, college tours. If any of you have been down this road, you know that the tours are all pretty much the same or at least they feel that way after about three of them. Basically, you show up, they corral you for a presentation on the school’s philosophy, facilities and policies, have a Q&A, then divvy you up to charming (hopefully) student representatives who lead you around the campus pointing out the highlights while regaling you with tales of traditions and student antics. Some are more successful at this than others, which is often clue enough as to whether the school is a good fit for your child. How we were treated by the student body while we were on the tours was a determining factors for at least four of the schools, two positive, and two negative. One of the schools surprised us though not in a flattering way, but rather they turned us off with their self-centeredness. Not everyone bothers visiting the schools which surprises me. Of course it isn’t always financially possible, especially if the school isn’t within driving distance. We didn’t have that problem since my eldest daughter aims to stay in New England. The younger daughter won’t have the luxury of visiting the schools she interested in since she aspires to go as far away as possible–le sigh. We’re getting closer to a decision. She’s narrowed it down to a handful of schools. We’ll be making one more foray to Vermont before the early admission deadlines start in November. Then begins the acceptance waiting game. Then the shell game of financial packages. Then the torrent of tears from her mother who is not ready for her first little chickie to leave the nest. Maybe accepting this new boy into my care is compensating for the loss I am anticipating. I’m determined to keep the focus on my work despite all the changes, events, and holidays coming. Most important is putting taking care of myself first on the list so I can survive all that is scheduled-not to mention those eventual unscheduled surprises. Which reminds me I need to hit the liqueur store to stock up on wine, the cheese shop and Staples. Now that the lazy days of summertime are over how do you prepare for the hectic days ahead? Is that what you call me? A Versatile Blogger! Well, that’s one way to phrase what I do around here. I’ve deliberately not defined the content, freeing myself to write about whatever strikes my fancy, or incurs my wrath. I’d like to thank Chris @ Life Your Way for this “major award” and her support of My Dubious Views blog, not to mention her humor, and generous spirit. 1) Thank the blogger who nominated you and include a link to their site. 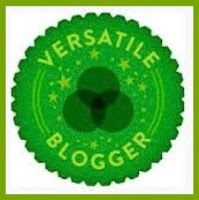 2) Add the Versatile Blogger Award picture to your blog post. 3) Nominate 7 fellow bloggers that you’ve recently discovered or follow regularly and include a link to their site. Norine @ Don’t Put Lizards in Your Ears You can’t go wrong with that advice. Yes, that’s only five — I’m a rebel and a rule breaker. I’ll have been married for twenty years this October. Crickey! I’m a breast cancer survivor. Brunch is my favorite meal and social activity.